The Giardino degli aranci (literally Garden of the Orange trees) is a tiny park that that overlooks the river Tiber. It features easily one of the most suggestive views of Rome. The view from the balcony covers the part of the city that goes from the San Pietro’s cupola to the river bay, one of the most romantic glimpses of the capital. Don’t hesitate to include this view in your when planning your tour. Panoramic view. The panoramic view from the Giardino degli Aranci is due to its position on Aventin Hill, which is the most isolated of the seven hills of Rome. What’s left of Savelli’s castle. Taking advantage of Aventin’s inaccessibility, the Savelli’s family built its fortress on top of it in the XIII century. The fortress was built on top of the X century Crescenzi’s castle. The Giardino, whose official name is Parco Savelli, was named after the family. Today all we have left of the fortress are the medieval walls that surround the park. On the opposite side of the apsis of the Santa Sabina’s church, you can spot the remains of the towers and the drawbridge. You can also spot some granaries and underground warehouses. The orange grove. The ownership of the park switched hands and went to the Dominican Friars in 1219. They got the custody of the Santa Sabina’s church and turned the whole space into a vegetable garden. According to the myth, the founder of the Order, San Domenico di Guzamn, brought in the first orange plants from Spain. The first orange tree was planted right in the nearby monastery and it’s still there today, protected by glass. 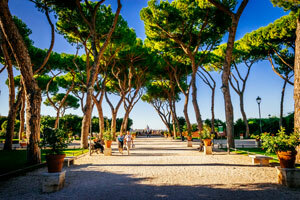 In 1932, a new city planning project turned the Giardino degli Aranci into a public park. So anyone who wanted to visit had free access. Architect Raffaele De Vico enhanced the spaces inside the old walls. He practically created the alleys, the green areas as well as the beautiful panoramic viewpoint that can stand its ground to those at Pincio and Gianicolo. During springtime the orange trees bloom, releasing an inebriating smell. This is another reason to go and enjoy this true corner of “roman paradise”. The S. Peter’s cupola from the keyhole. A few steps away from the Giardino degli Aranci, in Piazza Cavalieri di Malta, you will find the Priory of the Malta’s knights. It’s a mansion that, after hosting the Templars during the Middle Age, was owned in the XII century by the Order of Knights of the Hospital of Saint John of Jerusalem. This is a knightly order based first in Rhodes, then in Malta. Its function was to give refuge to the pilgrims on their way to the Holy Land. The building features now the embassy of the Sovereign Military Order of Malta in Italy. Even if it’s not open to the public, the mansion allows you to admire one of the most beautiful sights of Rome. 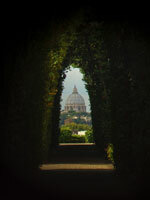 In fact you can peer the S.Peter’s cupola - perfectly framed by a tree-lined road - through the keyhole of the main gate. Long lineups form to enjoy this unique view of the cupola. So arm yourself with patience or try to get lucky and enjoy the view because it’s really worth it. Santa Sabina’s Basilica. Once you get to the Giardino degli Aranci we strongly recommend you to visit Santa Sabina's Basilica, located in piazza Pietro d’Illiria, 1. The main attraction of the Church is the V century cypress wooden portal: it’s formed by 18 sculpted panels and it features scenes from the Old and New Testament. It features also what is considered to be one the first portraits of Jesus Christ. Romantic walks. 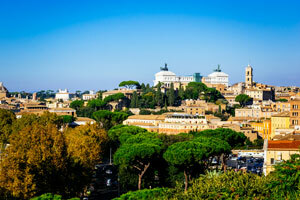 The park is located near Circus Maximus and near the City rose garden. So if you have visited these two sites, just continue to the Garden of Oranges and enjoy a romantic walk or a nice break seated among the trees. The area of the viewpoint is always very crowded, especially on weekends but you will find room for yourself. Wedding pictures. Many couples come here to take pictures on their wedding day, taking advantage of the magnificent view. Bring a hat, comfy shoes and, of course, cellphone or a camera to bring home an unforgettable memory of the city. From April to August 7:00 – 21:00. Main entrance: piazza Pietro d’Illiria. Buses: 81, 160, 628 on via della Greca and 23, 30, 44, 280, 130, 170, 716, 781 on Lungotevere Aventino.